I used colored pencils for the images and Distress Oxide inks for the background, but what I like most about this card are the details: Enamel dots for the falling snow, Stickles for the snow that is already on the ground and Nuvo Crystal Glaze for the bulbs. He utilizado lápices de colores para las imágenes y tintas Distress Oxide para el fondo, pero lo que más me gusta de esta tarjeta son los detalles: gotitas Enamel para la nieve que cae, Stickles para la nieve que ya está en el suelo y Nuvo Crystal Glaze para las bombillas. If you want to know more details about how I made this card you can watch the video below or at my Youtube channel. Si queréis más detalles sobre cómo he hecho esta tarjeta, podéis ver el vídeo de aquí abajo (o verlo en mi canal de Youtube). If you want a bit more inspiration with the new release, you can check this post I published yesterday. Si queréis un poco más de inspiración con la nueva colección, podéis echar un vistazo aquí. 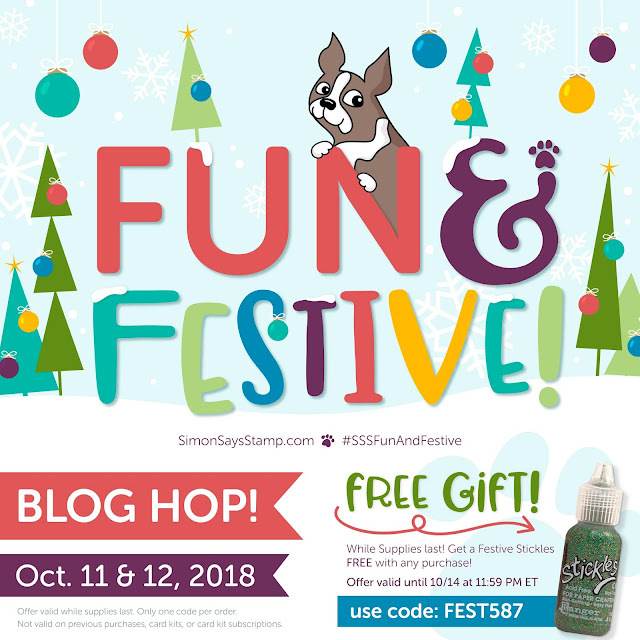 Este post es parte de un blog hop celebrando el nuevo lanzamiento de Simon Says Stamp y como siempre ¡hay un sorteo! Simon regala una tarjeta de 25$ en cada parada del blog, solo tenéis que dejar un comentario, así que asegúrate de pasar por todos los blogs para tener más oportunidades de ganar. Los ganadores se anunciarán el próximo miércoles en el blog de Simon Says Stamp. And now let's hop! Next stop is the fabulous Nichol Sphor! Y ahora ¡a saltar! La próxima parada es la maravillosa Nichol Sphor! Your card is just darling. I love how you made a yellow background instead of a traditional blue sky. Just beautiful! Love the sweet little scene you created. Also your cute reindeer card. That die is fun! Your scene card is so cute. And I love the reindeer card with the outlined snowflake background. Such a great idea. Two really sweet cards, I am loving that reindeer die! You cards are gorgeous! Love that little scene, so adorable!! Amanda, your beautiful winter scene has sent my Christmas spirit soaring! The shimmery ornaments, the gently falling snow, the sparkly snow on the ground: special touches that add so much impact! Your card from yesterday: incredibly pretty! Thank you for the smiles and inspiration! That's beautiful! It's a perfect wintry Christmas scene. I love this type of scene for Christmas! The snow falling, the pretty deer. Beautiful. Lovely cards, the first one is fantastic - what a versatile stamp set that is! LOVE the yellow background for the winter scene. I usually see a blue sky, but the yellow sky is so cheery. Two fun and festive cards. Loving the yellow background on this card! Love the golden glow for a gorgeous Christmas morning scene. I love both of the cards, but that winter scene is just so cute. I too love that you did the yellow for the sky in place of blue. Thank you for sharing and inspiring. The yellow background totally stood out to me also. what an impact! Pretty card! Such a sweet scene! Love the bright yellow sky! Beautiful, scenic card. Love you color choice. I love your sweet little deer card! The scene is so peaceful and beautiful and it looks amazing! Cute card & I love the untraditional colors! Both cards are very cute! Love the little winter scene you created. Both of your backgrounds are lovely! The yellow with the ornaments and winter scene are great! Love your reindeer card from your previous post. Such a fun idea with the repeating reindeer. Your background is lovely, as well. I love your card, and I liked both backgrounds! I'm glad you kept it in the video so that we could see your process. I like the reindeer card as well! Thanks for the inspiration! Each of these is cuter than the one before - can't decide which one to make first! super cute! love the sparkle! Adorable! Happy and festive. Love the winter scene. Sweet cards. I especially like the yellow sky on the scene - makes me think it's happening at sunrise. Love the unexpected yellow sky. What fun! Super Fun cards!!! I love your scene card!!! Such a cute little scene. LOVE the deer. Great cards for the holiday season! What an awesome card with this sweet scene, the deer and the string of lights!! Such a sweet card! I love these little scenes and your golden background was perfect. All the added sparkle and the glossy dimension on the lights were lovely finishing touches to your card. Fabulous release! So fun! Love your cards, Amanda, esp. the cute little winter scene. Like the winter scene you created. Like the snow background. I ordered the stamp/die set & look fwd to receiving it. OMG - I love how you did this card, and the sky is so unexpected but is "makes" the scene terrific. I love both of your holiday cards! Looking forward to these new releases. Your cards are fun, festive and an inspiring use of these cute new products. Such a warm scene. Your cards are lovely. Sweet scene. Love your card! Amanda, your card is so pretty! I love how it's similar yet unique compared with Cathy Z's card - would be fun to whip up a batch of both to send out for the holidays! Cute scene, and THAT background---fantastic! Your cards are so bright and cheerful! Love the simple beauty of your cards. WOW, this is just awesome. L♥VE IT! (Your card from yesterday is beautiful also. Well done. luv wshat you did with your Merry card! Cute cards...Love the fact that you used a different color for the background. thanks for sharing. love the yellow background. it makes everything pop out. thank u for sharing. Super sweet and wonderfully festive cards! Love your color combinations and lovely designs. The card turned out so sweet! I love that this stamp set gives you so many options, so fun. What a darling scene! I love that you used yellow for the sky! Adorable scene. I like the enamel dots for the snow. great cards!! I love the scene one-so pretty!! The deer one is stunning! Great job! Love the look of the snowflakes in the background with the dancing reindeer over the top. Very Cute Card. Wow, love the bright colors on your snow scene card! That bright yellow really makes the other colors pop. Great idea on the reindeer silhouettes--the red noses really bring the design to life. Love the little scene with the enamel dots on the background. Your other card is pretty also. I just love the yellow sky! Pretty cards! Absolutely love this darling card! Both skies were terrific. Stickles on the snow was perfect at the end. Everything about the miniature-ness was simply adorable. Your background is amazing! So softly blended. Fantastic cards! I love the Christmas scene! I love how you used the enamel dots for snow. It gives them a real presence on the card! Your card is so cute!! LOVE it and this new release!! Beautiful cards! I love the yellow background with the deer and the snow. So relaxing! Love your scene card! thanks for the video. Beautiful cards! I would never of thought to use a yellow/orange background but it is fantastic! It makes the card really pop! Lovely cards! I love the warm background on the scenic cards and the layers on your reindeer card - lovely! your creativity is always so amazing! Beautiful cards, the dancing reindeer are adorable. Your cards are beautiful and yes, very inspirational. Love the bright and cheery yellow sky! Such a cute card Amanda! Thank you so much for the idea! I love this set! Your card is so sweet!! I love the Winter Scene set. Love the winter scene set... very cute. I love deer on Christmas cards...sweet scene. So precious! I love the yellow sky!!! I feel like this winter scene set suits your style really well. I love your colors and coloring; it's very soft and pretty and perfectly wintery. Thanks for sharing with us! Love the scene you created with the deer. Love this Fun & Festive release! Delightful cards! Love the Winter Scene card and your pretty coloring! The Dancing Deer die is a favorite.... at the top of my wish list! Great cards, Amanda! I love the fresh look to traditional cards! That wonderful yellow sky is such a clever choice! Thanks so much for the inspiration! So cute card ! I love these colors ! Great cards! I really love the Nuvo accents you added to both, just the right bit of gloss and texture and pop! Your cards are so pretty! I especially love those dancing deeer! Wonderful cards! Really love your little winter scene! Love the scene in the first. Fabulous cards! The deer outline card is super fun! Creative cards. Different colours used and I love it. While I like both cards, the first one stopped me in my tracks. The color of the sky adds so much unexpected radiance that I can't help but be drawn to it. And I love the SSS images that complete the wintry scene. Great job! Yes, thank God for coordinating dies, that scene is adorable and the varios textures are so fun ! When I came on your blog I was happy suprised that you used a yellowish background for your card. Than the video started and I though first it was the wrong video, but half way all came good and I saw your lovely yellowish background. Thank you so much Amanda for showing your beautiful card. I love how you used SSS’s newest releases. They are so Christmasy!! I love the one with deer. It so precious!! What a cute scene card. Beautiful cards! I love the yellow/amber sky instead of the traditional blue on your lovely little winter scene you created. It seems to just make the images pop! And the subtle sparkle and shine is a nice touch too. It's there but not so blingy that it distracts from the peaceful scene.